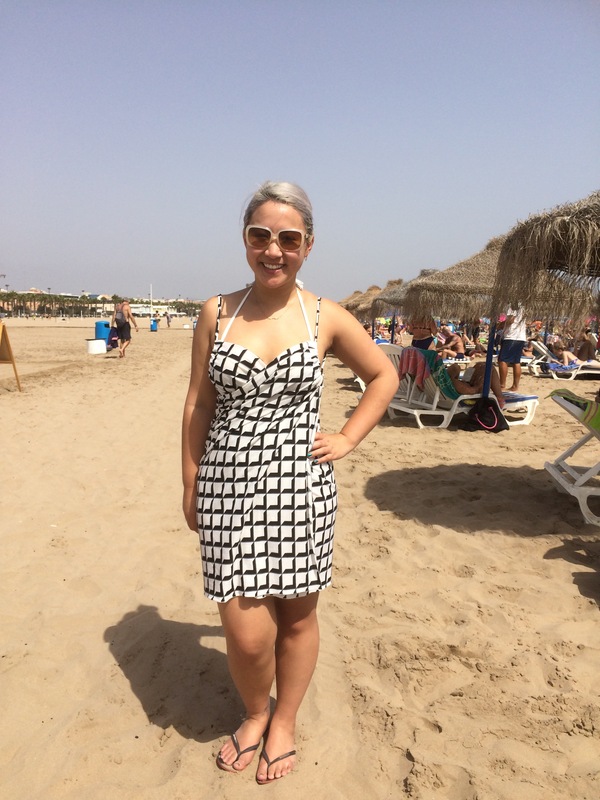 I saw a pin recently on Pinterest (obvs…) of a wrap beach cover up that looked amazing! It was such a nifty idea for a very quick DIY project! I loved the idea of it but I wasn’t keen on the low back so much. I thought I could perhaps figure out a way to make a pattern that’ll work for me though. I doodled and played with numbers for a bit and came up with a vague plan to cut a trapeze shaped back piece and two rectangles for the wrap front. Luckily I had just enough fabric to try again. This time I figured I’d be less adventurous – make it up how it looked in the photo and then adjust from there. I added a channel of jersey to the armholes and threaded the straps through (I used a strip of the selvedge for my strap. I’m planning to change them to black ribbon later!) to create a gather at the base of the armhole. It turned out that I didn’t really need to alter it in the end. Because I had less fabric to work with, I think what I made ended up being a lot smaller than the one off Pinterest which, by default, took away a lot of the excess in the back. Not bad for 20 minutes work and 2 seams! -Find some jersey! I used a poly cotton jersey with a reasonable amount stretch. Avoid full cottons if possible as they tend to take longer to dry – not good if you’re damp from the beach!Cut a rectangle that is around 1.5 times your hip width by length you want it to be at the front. Alternatively, you can just take a metre(or less if you prefer) of 150cm wide fabric which would also do the trick. -Fold the fabric in half, short sides together. -Cut an arc into the corner (a quarter circle as if the corner point is the centre of the circle) around 15cm from the corner. This is going to be part of the armhole. -Measure the length of the arc you’ve cut. -Cut two rectangles which are the length of the arc by 7cm wide. -Fold the rectangles wrong sides together and pin to the right sides of the arc. -Stitch together at 1.5cm from the edge to create a channel of jersey along the arc. -Use some ribbon as a strap or create your own from fabric – do as I did and just cut a length from the selvedge or for something neater you could try cutting and stitching a “tube” turned inside out. -Attach a safety pin to the end of your strap and feed it through the channel of jersey you made. -Knot the strap together and try it on! Gathers will be created where the strap pulls for that rushed effect. -Adjust the strap lengths if needed to make sure it fits properly. -I left my straps knotted but you should probably sew them together for a more secure finish! NB. If you’re much larger or much smaller than I am you might need adjust a few of these measurements to make sure things fit properly! Great idea, I am totally making this! I like your version way better than the Victoria secret version. Such cute material! I love this, from the front it could totally be a dress, the way it hangs is so flattering, I need one of these in my life, I wonder if a little elastic across the top back would pull it in and raise it?? Amazing!! Thanks! Elastic could do more to raise it up a little more at the back for sure! You’re so clever! Thanks so much for the tutorial! I love it so much. I saw the Pinterest version a while ago, and I like the front but the not the back. Now that you posted a tutorial with a higher back I will be adding this to my sewing list. This is absolutely fantastic! I want one immediately, and I haven’t gone to the beach in years! haha. Lol. You can make one ready for whenever you go next!